This cereal was described on the box as a "whole grain cereal with a sweet touch of honey." When it first appeared in stores, a large image of Hockey Star Wayne Gretzky appeared on the front of the box. He would appear on later boxes, but smaller. The cereal pieces were shaped like stars with holes in the middle. Known Premiums: Contest to Win a Breakfast with Wayne Gretzky, Free Action Cards inside the box and a free Pro Stars poster inside the box. For another Hockey-themed cereal, check out Power Play Cereal which was introduced by Post in 2002. What do you think of Pro Stars? I remember as a kid having Pro-Stars on our kitchen table. My brothers were diabetics, so the no sugar added was the one of choice.... Please bring them back. I remember Wayne Gretzky on the box, hockey card inside, our mom would save 5 cards and give us each one when she had enough. I miss this cereal so much! The best cereal ever! I would buy thousands of boxes if it came back again. My favorite cereal for years when I was a kid. Long gone of course but if you're feeling nostalgic check out Dora cereal (this site). No idea if it tastes the same but it looks identical. 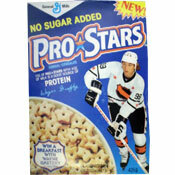 Bring back Pro Stars Cereal. Great cereal with great star shaped pieces and I loved the boxes. 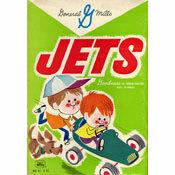 Wayne Gretsky's own cereal, I actually liked this cereal a lot. It was basically a star-shaped cheerio with a bit of aspartame to sweeten it. They weren't overly-sweetened so you couldn't complain that they were artificially-sweetened to a degree one could complain about. So you had the satisfying, oaty crunch of Cheerios, a bit of extra sweetness, but less concern about the sugar content of the cereal. I also found the shape to be a little fuller in the mouth than the Cheerios "O". I'd be interested to see Cheerios throw a few stars in their cereal for special promotions, actually. A cereal that I definitely miss.